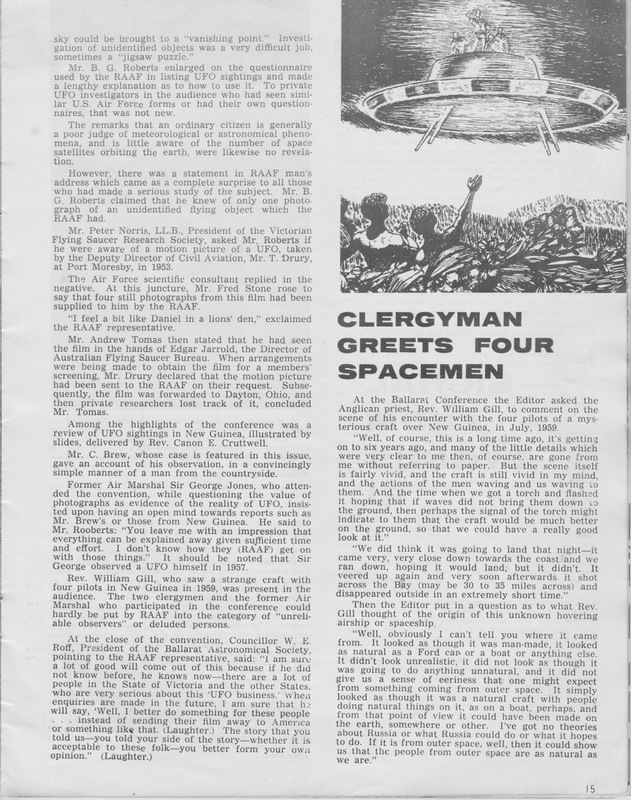 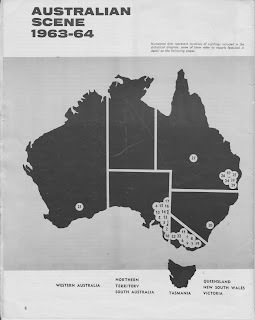 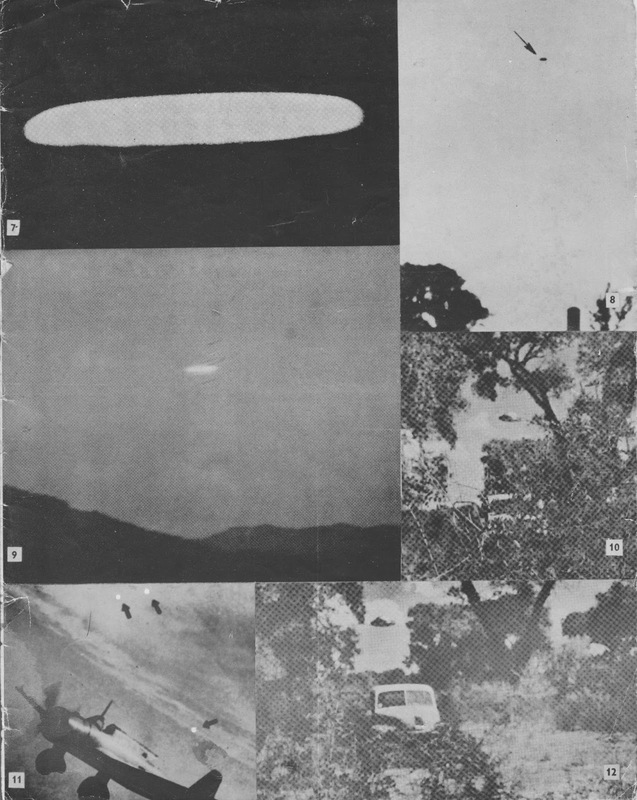 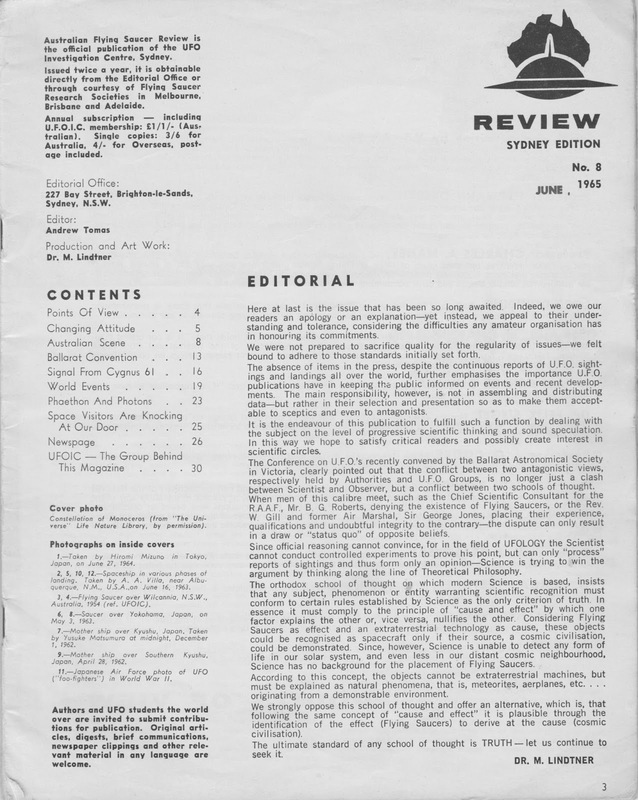 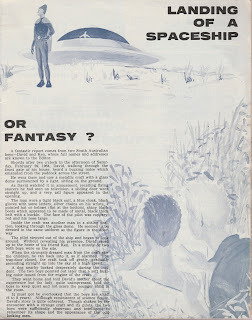 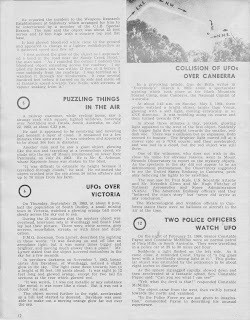 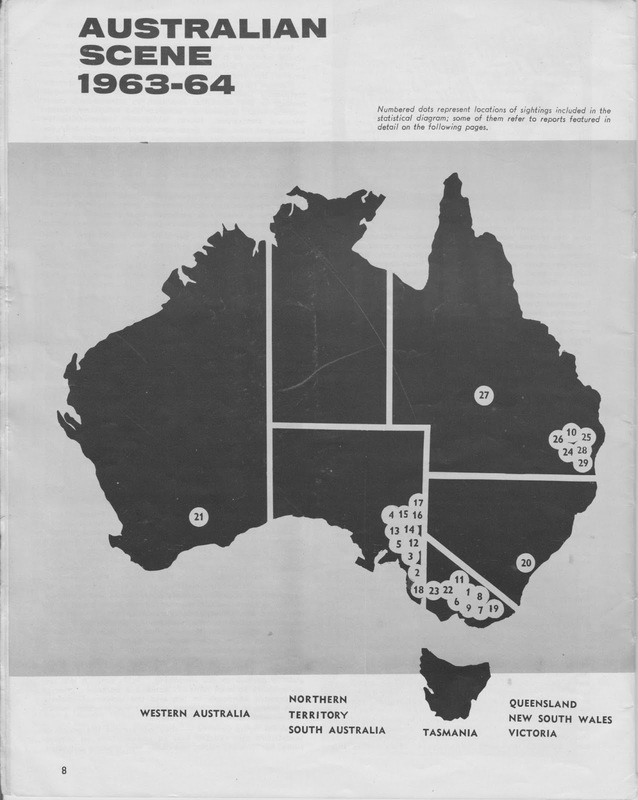 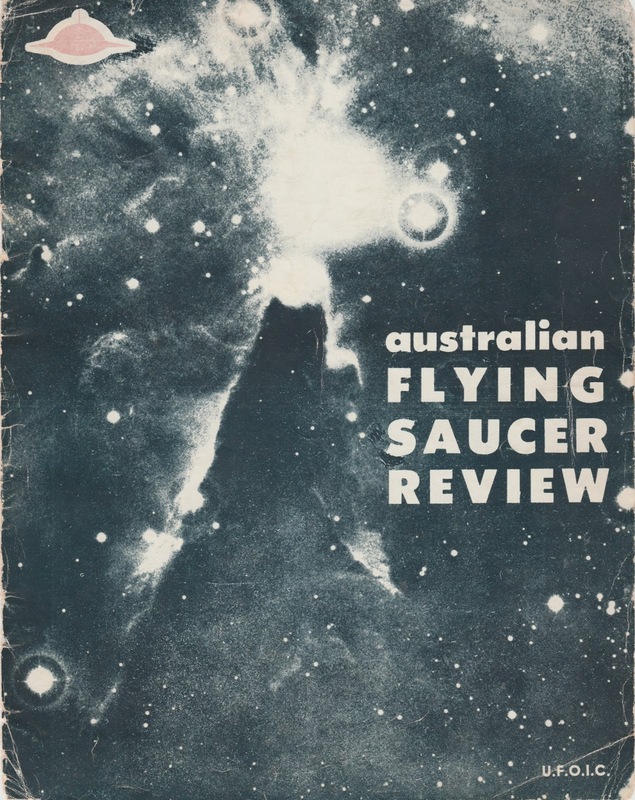 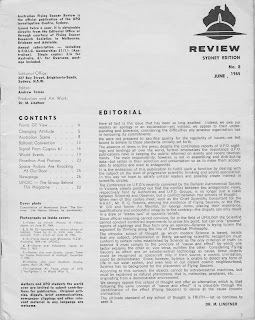 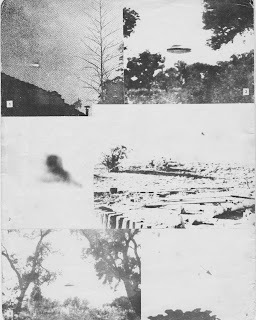 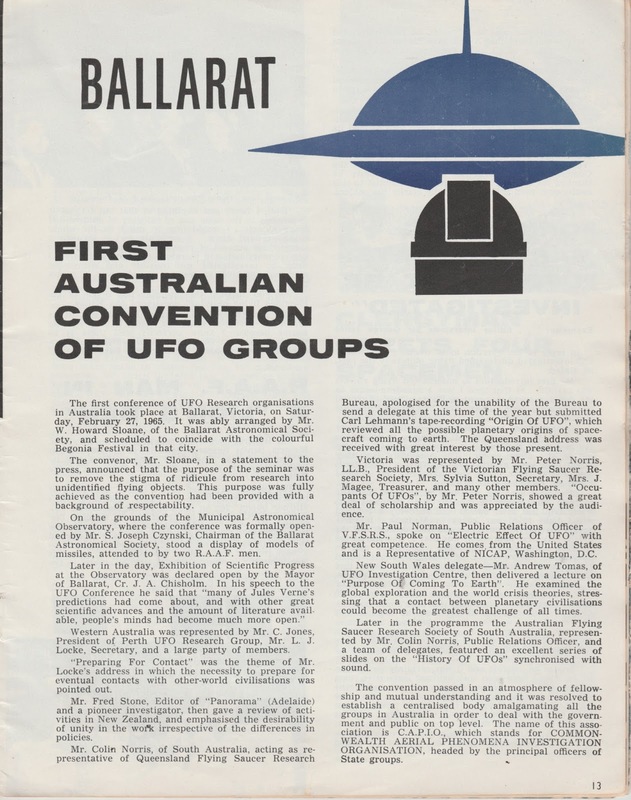 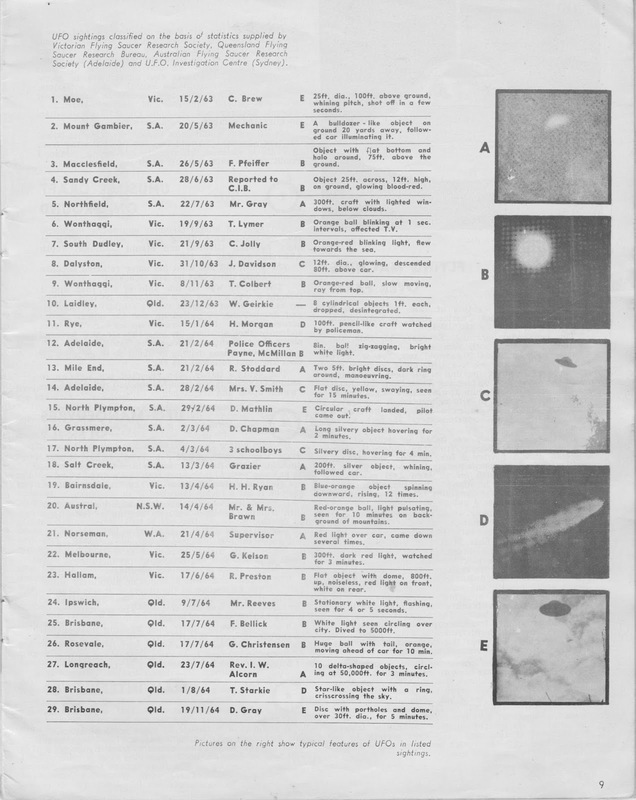 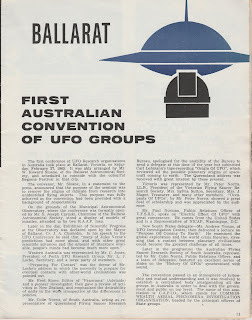 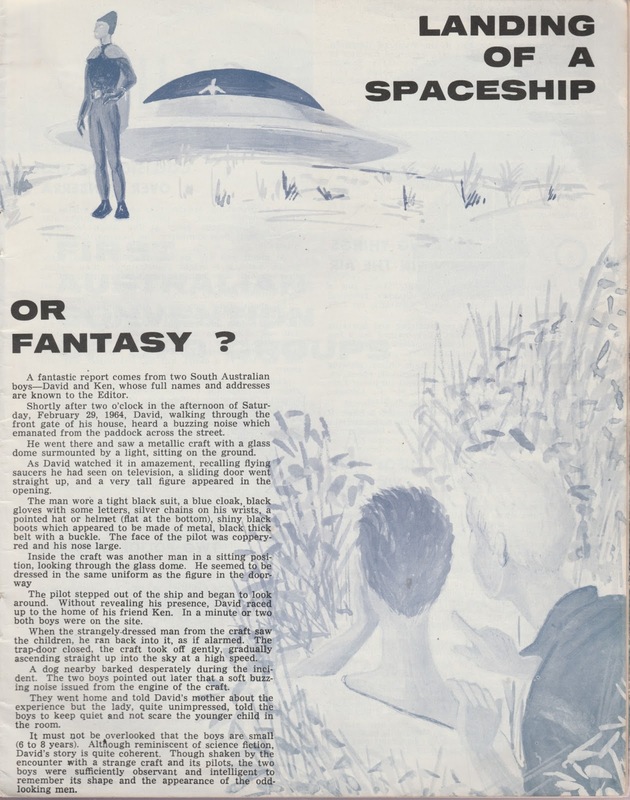 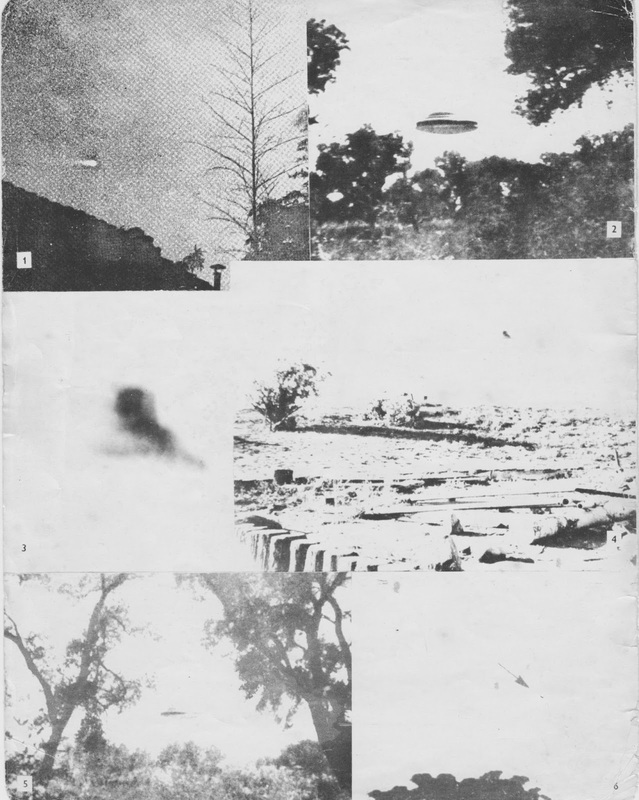 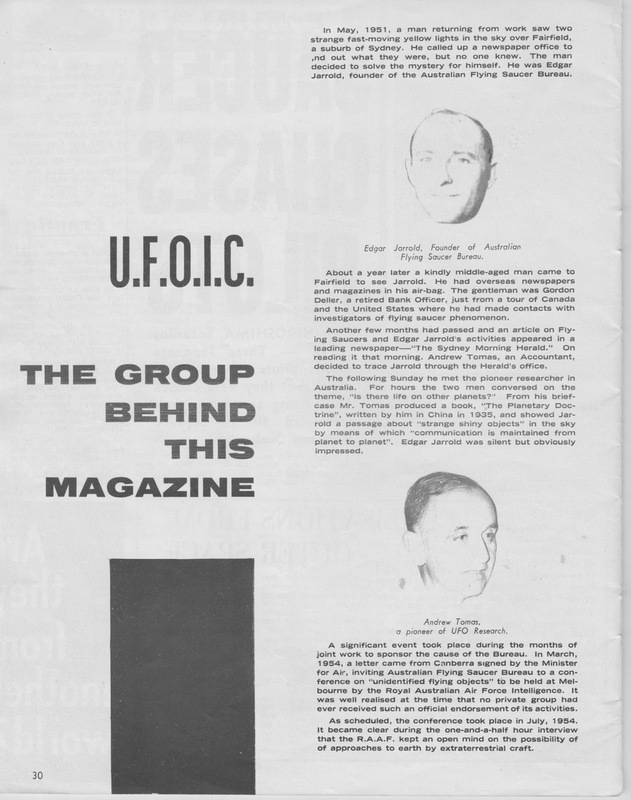 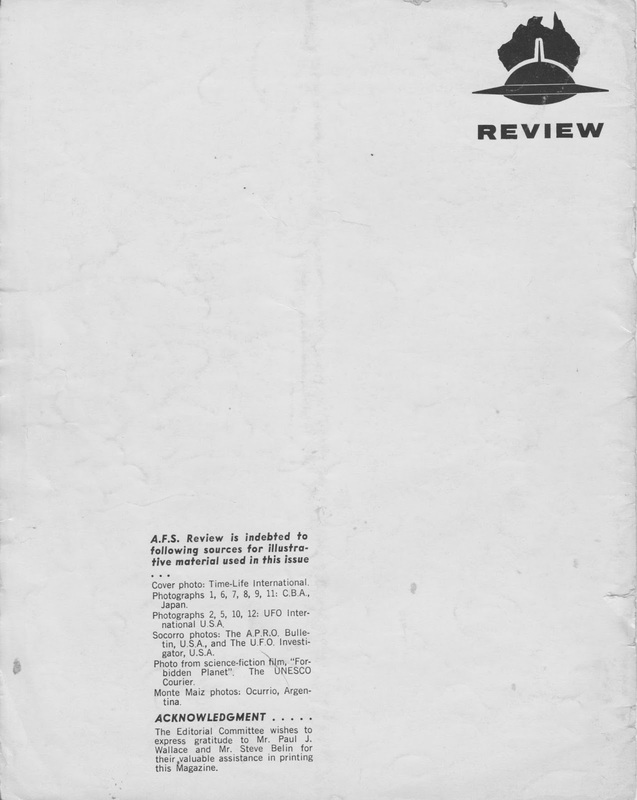 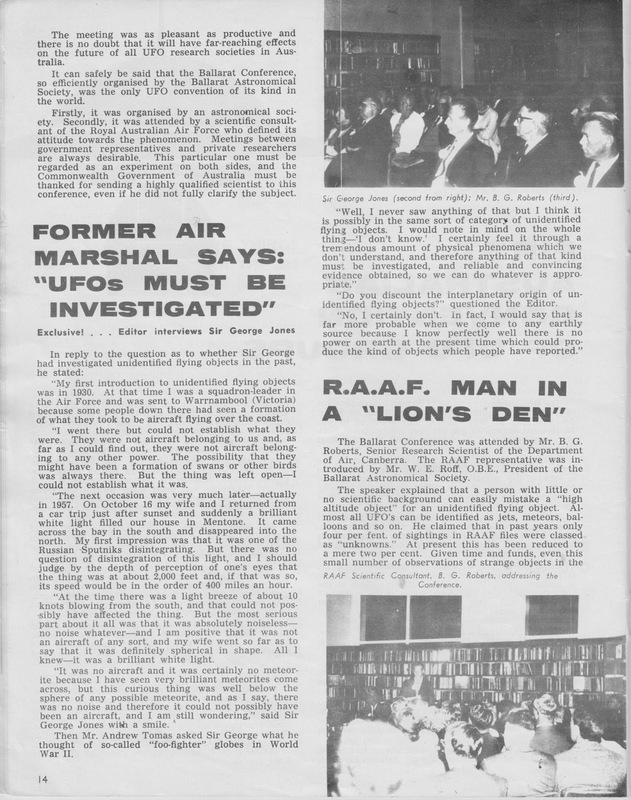 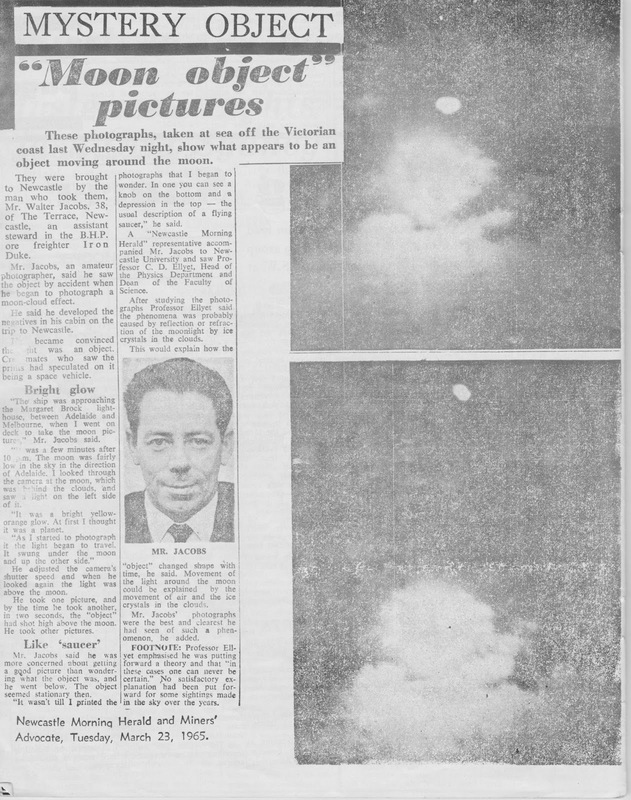 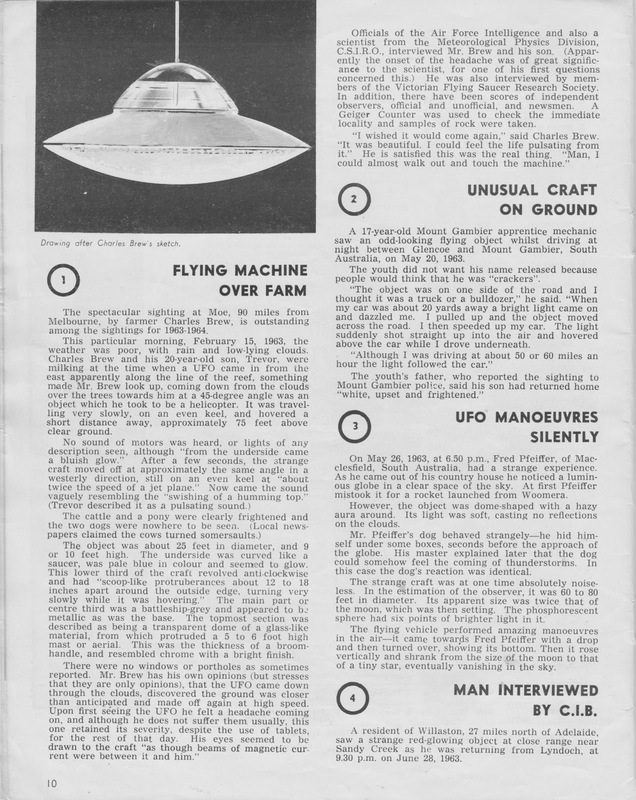 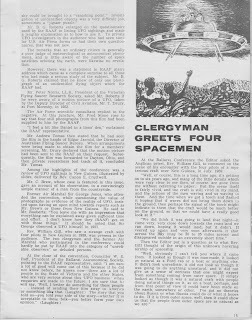 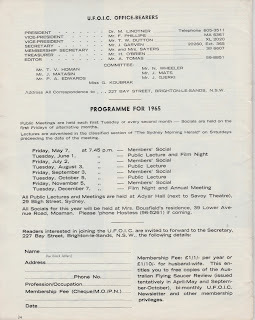 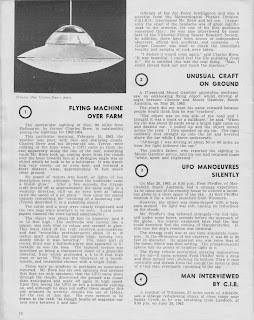 As part of the 60th anniversary of the UFOIC investigation Centre (UFOIC) I present here scans of the key Australian aspects of the groups 1965 publication of the Australian Flying Saucer Review. 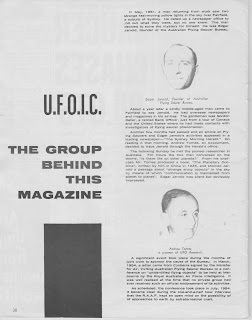 This is particularly appropriate as the issue includes a 4 page feature "UFOIC - The group behind this magazine". 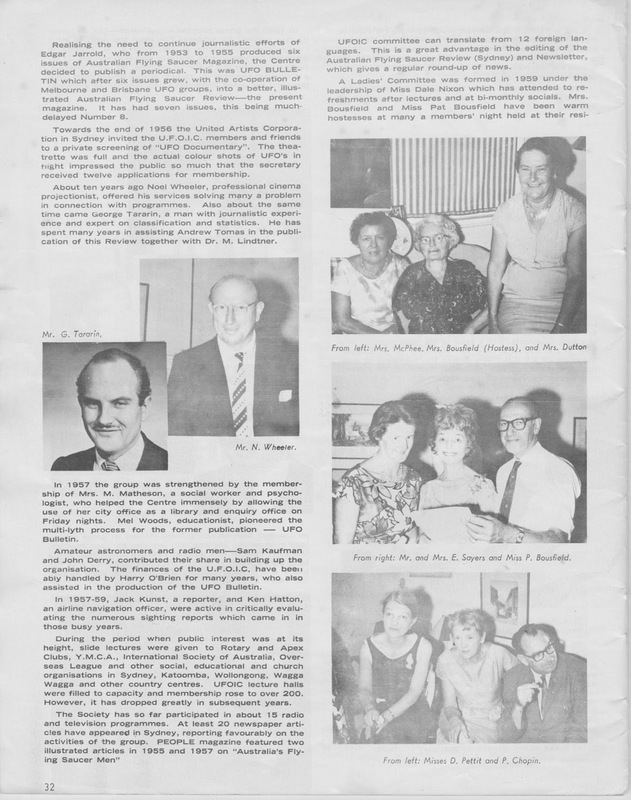 It includes a photo of my old friend Fred Phillips, whose extraordinary library I recollect spending a number of long conversations and reveries with Fred. 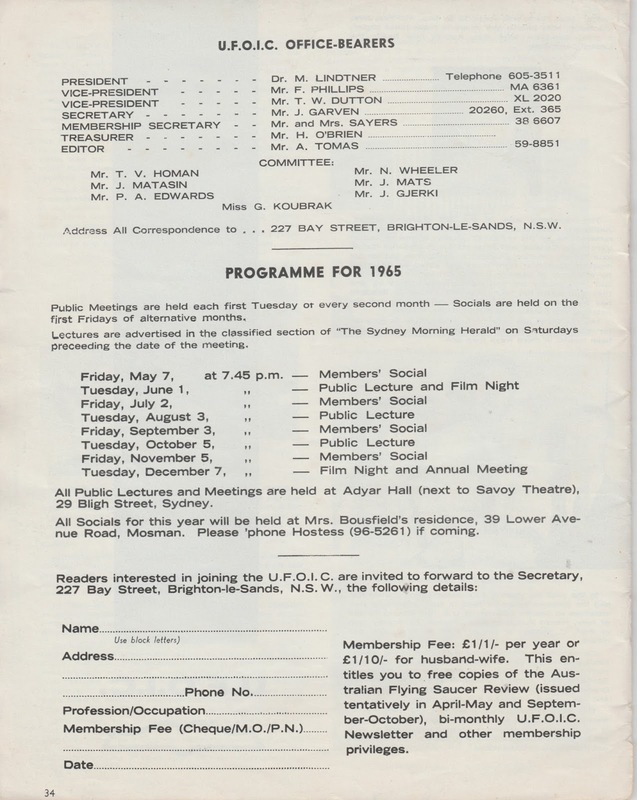 It was there in about 1975 he handed me a copy of Tas Homan's reproduction of the extraordinary 1868-1873 memorandum book of Frederick William Birmingham. 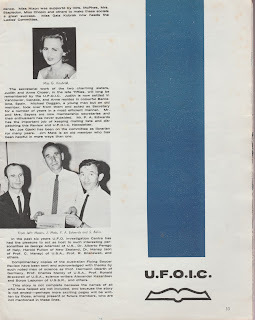 The same article also mentions my dear late friend Judith Croser (1940-2016): "The secretarial work of the two charming sisters, Judith and Anne Croser, in the late fifties, will long be remembered by the U.F.O.I.C. 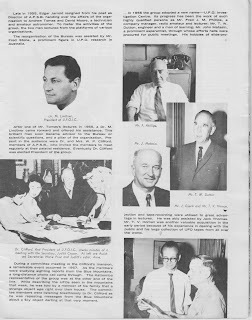 Judith is now (1965 - B.C.) 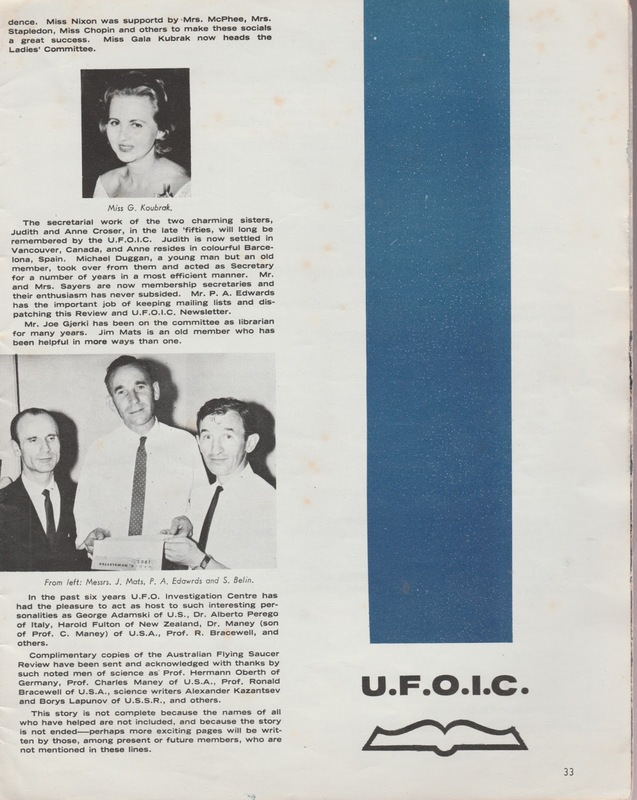 settled in Vancouver, Canada, and Anne resides in colourful Barcelona, Spain." 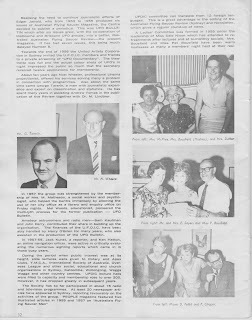 Among many things, Judith shared with me correspondence between her sister Anne and Andrew Tomas. 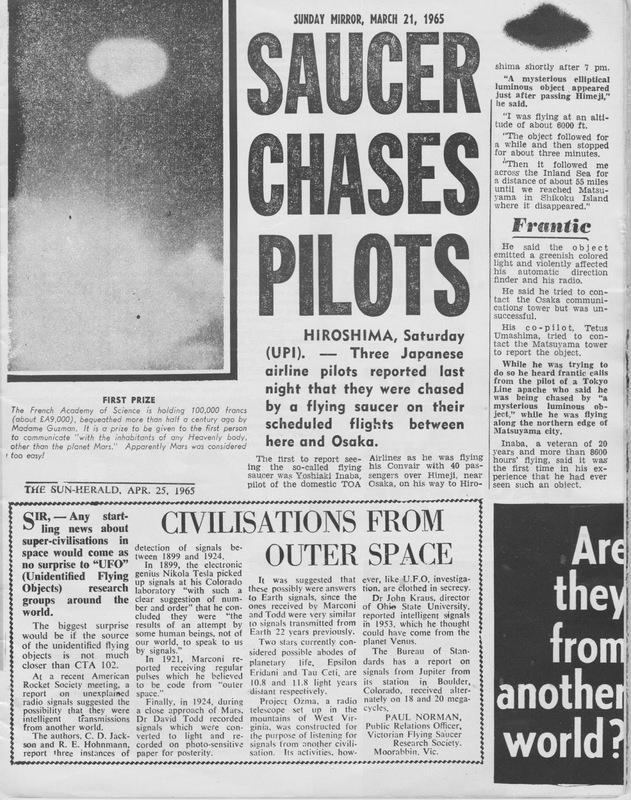 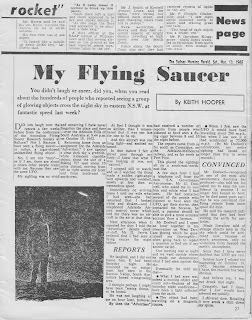 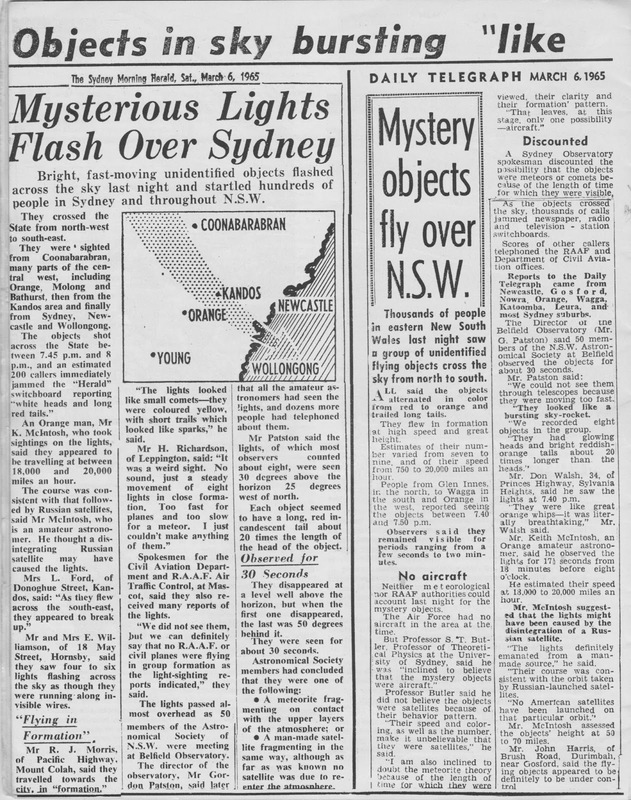 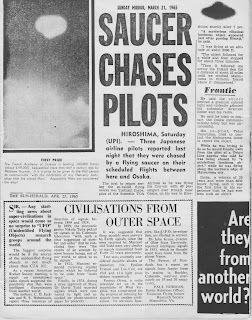 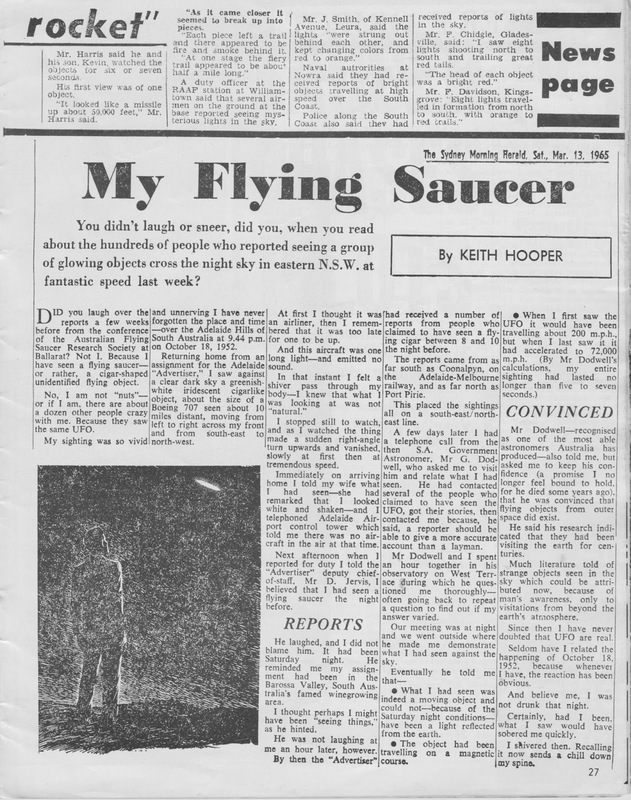 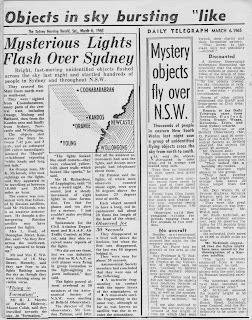 "My Flying Saucer" - the March 1965 article by Keith Hooper in the Sydney Morning Herald revealed the secret UFO interests of South Australia government astronomer George Dodwell. 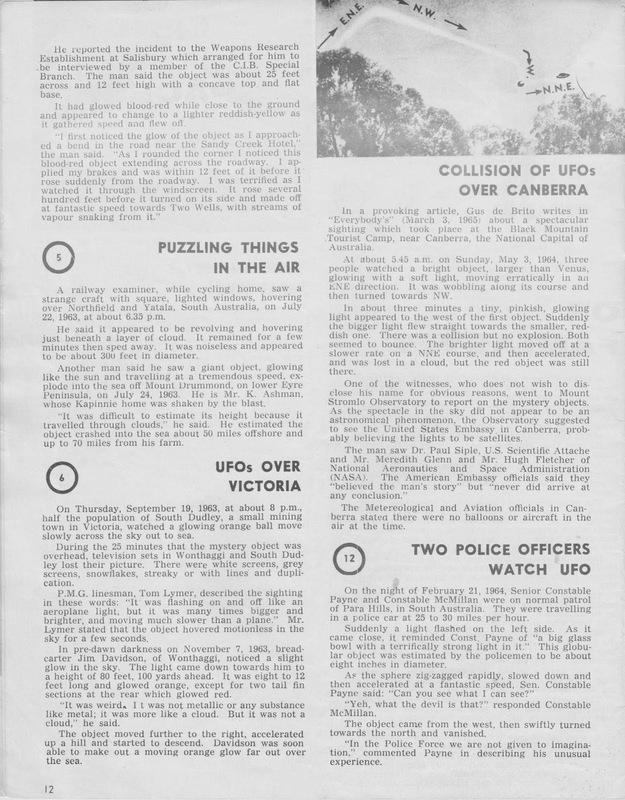 The article did not reveal that Dodwell had witnessed a UFO way back in 1902. 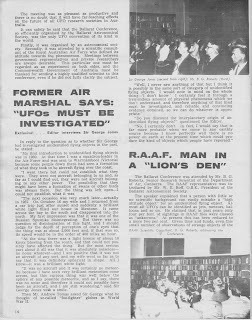 See my post.